The Options Menu contains a few productivity features to help you work through chat requests. Let’s take a closer look at each option. The Saved Reply and Insert a GIF options are not available yet. You can end a chat while chatting, or after a customer has left the chat. When a chat ends, we create a conversation in Help Scout and email the customer a copy of the transcript. 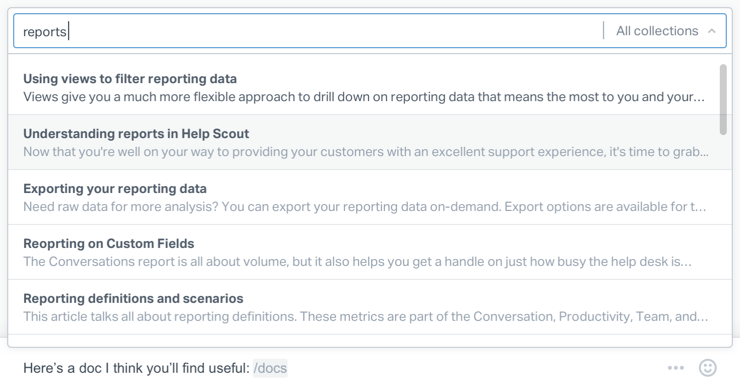 The Docs search integration helps you locate, review, and send articles to customers while chatting. You can search for articles across all Docs sites and collections. Clicking Attach a File opens the OS file browser. You can upload any file type, except executables. Once the file is uploaded, hit Send to send the files to the customer. Additional message text is optional. You can send the file by itself, or add a message to send at the same time. 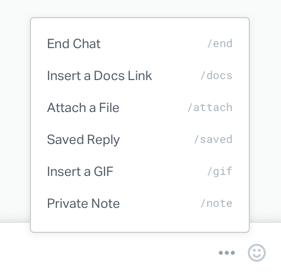 Switch to the note editor to add a private note at any time during a live chat. You might add a note to keep tabs on important bits of information as things come up during the conversation. If you’re viewing an Assigned chat, you can add a note to help teammates as they’re chatting.